Better knot performance with a smooth elongated structure. 1) Pass a 10 to 15" length of Line/Spectra through the eye twice and form a loop. For even greater knot strength, double the Line/Spectra if the eye will allow. 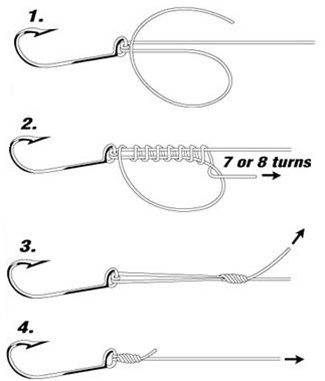 2) Wrapping through the loop and around the standing line, make 8 to 10 wraps. 3) Pull on the tag end. Look to see that the wraps form a neat orderly knot. 4) Tighten the knot and trim the tag end. Turnaround clinch knot.